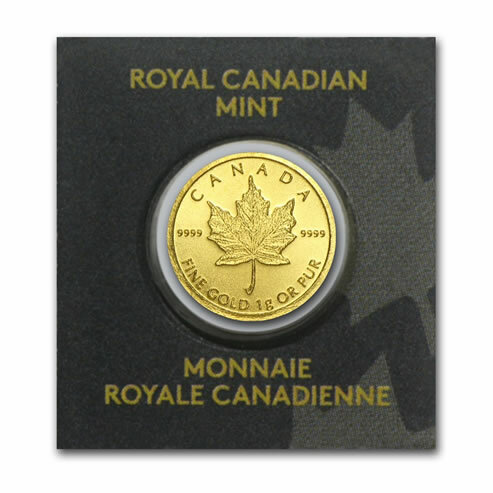 The RCM Gold Maple Leaf bullion coin is now available in a one gram format. 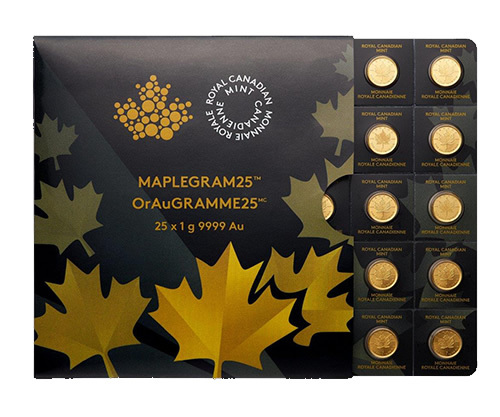 Packaged in sets of 25 legal tender coins, the Mint|s new Maplegram25™ product is as refined in the precise engraving of the iconic Gold Maple Leaf design in minute scale, as it is for its signature 99.99% purity. The distinctive one gram legal tender pure gold coins in Maplegram25™ retain a bullion finish and are packaged in a divisible blister card that individually serializes each coin for added security and authenticity. The card fits in a branded protective sleeve on which is printed an assay certificate certifying the purity and weight of the coins, which are Canadian legal tender with a 50 cent face value. 1 oz RCM Gold M..